23.03.1978 - 07.04.2019 Loving son of Russell and Debra (dec). Brother of Kellie. We are so proud of what you have achieved in 41 years. I thought you were bulletproof but I was proven wrong. You have left us with so many special memories that we will cherish forever. I will make sure that I will always be there for the boys and Kirsty. You will stay in our hearts forever. 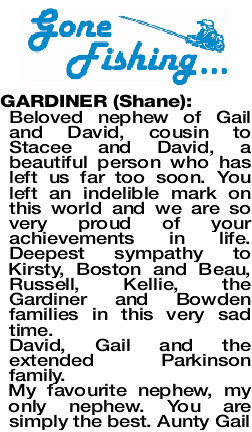 Our deepest sympathy to the Gardiner and Bowden families. Family and Friends of the late Mr Shane Patrick Gardiner of Bunbury, formerly of Donnybrook, are invited to attend his Funeral Service, to be held in the Crematorium Chapel, Belcher Street BUNBURY commencing at 11.00am on FRIDAY (26.4.2019). 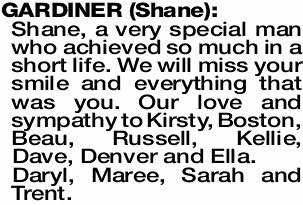 To Russy, Shane’s wife and family and all the Gardiner Family at this sad time I extend my heartfelt sympathy at the sad loss of Shane. Words cannot express the heartache that you are all going through. Our condolences to all the family. Sharing the loss of a Nephew who was a thorough gentleman, great family man and a good example for others. 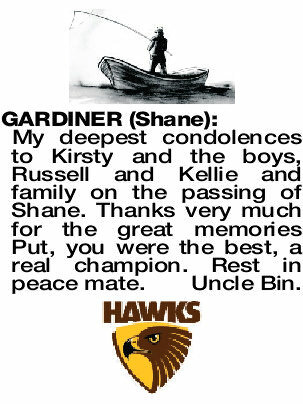 Condolences to Kirsty and The Boys, Russell and Kellie and to the Gardiner and Bowden Families. 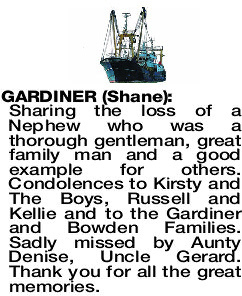 Sadly missed by Aunty Denise, Uncle Gerard. Thank you for all the great memories. 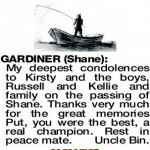 GARDINER SHANE Gone far too soon but achieved so much in a short life. Your memory will live forever in your beautiful boys and loving wife. 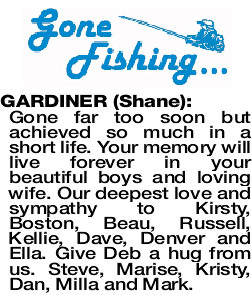 Our deepest love and sympathy to Kirsty, Boston, Beau, Russell, Kellie, Dave, Denver and Ella. Give Deb a hug from us. Steve, Marise, Kristy, Dan, Milla and Mark. 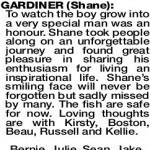 GARDINER SHANE To watch the boy grow into a very special man was an honour. Shane took people along on an unforgettable journey and found great pleasure in sharing his enthusiasm for living an inspirational life. Shane's smiling face will never be forgotten but sadly missed by many. The fish are safe for now. Loving thoughts are with Kirsty, Boston, Beau, Russell and Kellie. 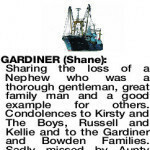 My deepest condolences to Kirsty and the boys, Russell and Kellie and family on the passing of Shane. Thanks very much for the great memories Put, you were the best, a real champion. Rest in peace mate. Uncle Bin. 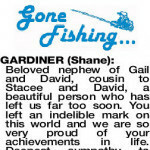 GARDINER SHANE Beloved nephew of Gail and David, cousin to Stacee and David, a beautiful person who has left us far too soon. You left an indelible mark on this world and we are so very proud of your achievements in life. 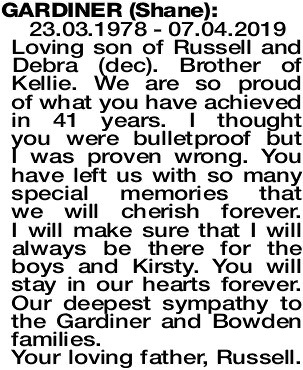 Deepest sympathy to Kirsty, Boston and Beau, Russell, Kellie, the Gardiner and Bowden families in this very sad time. David, Gail and the extended Parkinson family. 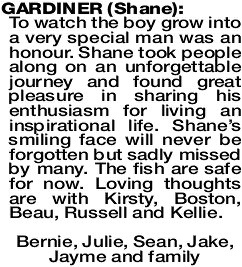 Shane, a very special man who achieved so much in a short life. We will miss your smile and everything that was you. 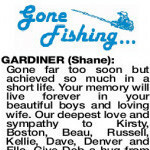 Our love and sympathy to Kirsty, Boston, Beau, Russell, Kellie, Dave, Denver and Ella. Daryl, Maree, Sarah and Trent. 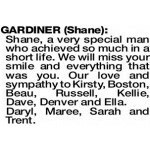 GARDINER SHANE Gardy you were such a big part of my life. I will miss your words, our wines and your faith in me. You have left behind such a legacy and your beautiful wife and boys will have so much love around them from the huge number of people that loved you. 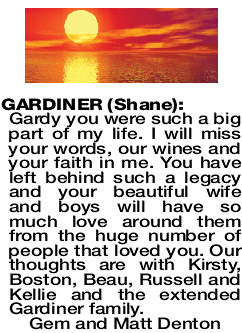 Our thoughts are with Kirsty, Boston, Beau, Russell and Kellie and the extended Gardiner family.